Who is it for? The Avon Naturals Honey And Milk Nourishing Face Wash is for women with dry skin type. As it contains honey and milk, it is not suitable for oily skin type. This product is used to remove any dirt and impurities on your skin and make your rough skin nourished and smooth. Rs. 179 for 100 mL of product. Wet your face with water and take a small amount of face wash from the tube. Rub your hands together to create some lather and apply it all over your face and neck. 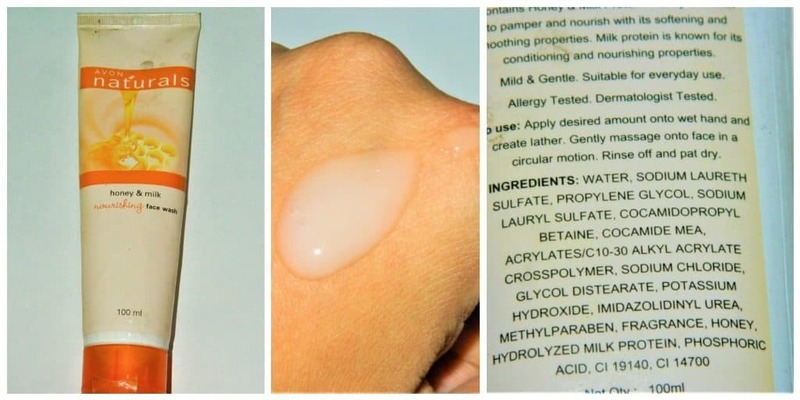 Massage it onto your face in a circular motion for about 1 min and wash off the product with water. Pat dry your face with a soft towel and you are done! No. I haven’t experienced any irritation while using this product. The Avon Naturals face wash comes in a long, light coloured tube. Any outer packaging is not provided by the company, so it comes without any cardboard box or plastic wrap. Although the cap of the tube is sealed, so there are no issues about the quality of the product. The texture of the face wash is creamy and smooth. It doesn’t have any particles and feels very milky. On the face, you can feel the moisturization due to the face wash. After wash, it makes your skin very soft and smooth to touch. The face wash has a very sweet fruity and earthy smell. For the dry skin type, this face wash is very effective. It nourishes and moisturizes the skin and leaves your skin with a smooth texture. The honey extracts nourish and soften your skin and the milk extracts provide some conditioning. This does not help in controlling the oil secretion on your face, therefore, cannot be used as pimple control or oil control face wash for oily skin type. It isn’t very expensive. The amount of the product available is quite good. Soothes and softens the skin in one wash.
Removes dirt and other impurities. Feels very light while applying. Works best only for the dry skin type. Packaging is not up to the mark. I would definitely recommend this face wash to all the dry-skinned beauties out there. This is an amazing face wash to provide nourishment and moisturization to your skin. As I have oily skin, I only use this in winters when the harsh cold makes my skin looks dry and flaky. So I wouldn’t be repurchasing this. Bblunt Climate Control Anti Frizz Cream – Good Buy ?